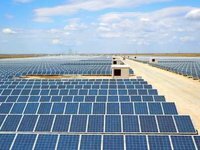 Head of Luhansk civil and military administration Yuriy Harbuz has said Chinese investors are interested in launching photovoltaic (PV) panel production in the region. "Recently I had investors from China under the industry development program. We are looking for an option to organize PV panel production here," he said in an interview with the Uriadovy Kurier publication. He said that the region has skilled staff and industrial sites where they can work. He also said that there is demand on PV panels in the region.